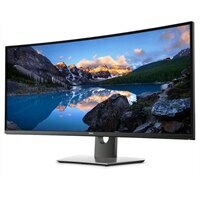 Dell UltraSharp 38 Curved Monitor: U3818DWEnvision all you can do. 37.5-inch WQHD curved monitor featuring InfinityEdge. Immersive views and incredible visuals mean fewer distractions and improved multitasking. You’ll be inspired to do more: With a near-complete field view and a panoramic screen experience, you’ll be pleasantly immersed in whatever you’re working on. Consistent Color. Incredible detail: Expect sRGB color calibration and ComfortView on a curved display with WQHD resolution. Multitask like a pro: With features like Dell Easy Arrange, Picture-in-Picture and Picture-by-Picture, you can customize your display to manage multiple projects at once.